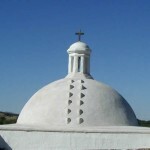 Restoration of the church dome in Tumacacori National Historic Park, Arizona. 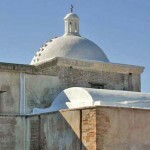 Originally built with adobe in 1821, the dome was badly damaged mainly due to the use of improper modern materials for maintenance and past restoration. Layers of impervious materials such as cement, acrylics, waterproofing, etc. 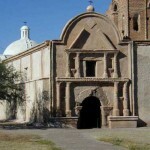 were removed, revealing the original adobe structure. The dome was then covered with a minimum of five layers of NHL 5 and NHL 3.5, recreating the original dome with adequate protection.